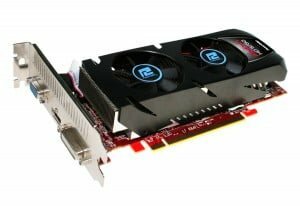 TUL Corporation, a leading manufacturer of AMD graphics cards, today announced improved gaming performance for HTPC gamers. The PowerColor HD5750 Low Profile Edition is specifically designed for those with HTPC systems or limited space chassis’ who desire the upgraded graphics performance without having to compromise their system size. The PowerColor HD5750 Low Profile Edition is equipped with a dual fan design and heatsinks that fully cover GPU, memory and MOSFET. The design cools temperatures and dissipates heat for vital components within a limited space. Furthermore, by taking advantage of the low profile design, this unique solution can be used for small form factor and slim systems, maximizing the rig’s performance in a limited space. The PowerColor HD5750 Low Profile Edition uses high quality components, including Dr. MOS, solid capacitors and a solid state choke, which not only extends the products lifecycle, but also provides high and stable gaming performance. The card clocks in at 700MHz core speed / 1150MHz memory speed and includes the fastest GDDR5 memory today; enhancing the data transmission rates up to 4.6Gbps. This latest edition is also equipped with HDMI / DVI / VGA outputs, providing the full HD video interface for HTPC users. Gamers can enjoy full HD or Blu-Ray video through each display; also with the support of the latest DirectX 11 technology, gamers experience vivid graphics like never before.